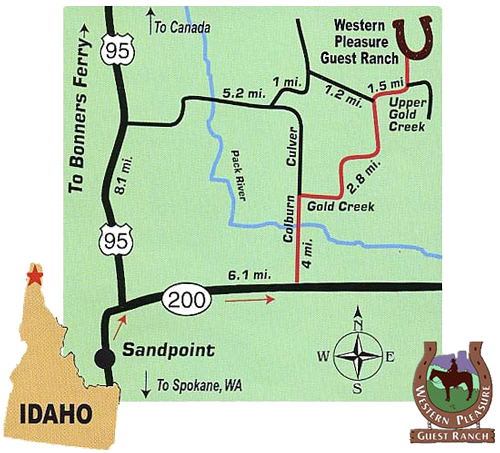 Western Pleasure Guest Ranch is located just 16 scenic miles NE of the beautiful small town of Sandpoint, Idaho. USA today recently voted Sandpoint as the most beautiful small town in the US. Resting at the base of the Selkirk Mountains in North Idaho’s Panhandle region, the community of Sandpoint can be found 60 miles south of the Canadian border and 75 miles northeast of Spokane, Washington. For those visiting the ranch in the winter you will be glad to know that 26 miles from the ranch is Schweitzer Mountain Ski Resort. Schweitzer is a pristine jewel situated in the Selkirk Mountains, and is the perfect location for your next ski vacation. This mountain boasts 2,500 acres of the most beautiful, breathtaking scenery imaginable, with views of Canada and two states. Enjoy a variety of terrain from smooth corduroy groomers to wide open bowls and gladed runs, 62 trails, and Idaho’s only high-speed, six-person ski lift… all at an elevation of 6,400 feet! The ski season at Schweitzer Mountain Resort lasts from November to April. If you’re looking for one of the best getaway ski packages, check out our Schweitzer Resort Ski Packages! Western Pleasure Guest Ranch is easier to get to than you may think. From I-90 either east or west, take the US-95 exit # 12 in Coeur d’Alene and head north to Sandpoint. Before arriving in Sandpoint, you will cross the Long Bridge. After crossing the Long Bridge, continue North on 95 until the HWY 200 exit. Take the HWY 200 exit to the right then continue on HWY 200 for 6.1 miles until you reach Colburn-Culver Rd. Turn left on Colburn-Culver and continue for 4.0 miles to Gold Creek Rd., turn right and continue for 2.8 miles to Upper Gold Creek. Follow Upper Gold Creek 1.5 miles to the lodge (Watch for the blue Western Pleasure Signs along the way).